A detailed report put together by Jan Dawson, compares all four major U.S. carriers’ performance and stats after each published their second quarter performances. All in all, it makes for great reading from a T-Mobile perspective. T-Mo lead the way with net subscriber additions and losses, and as a result is closer than ever to catching up with Old Yeller. If taken a few of the highlights here, but you should check out the full report. 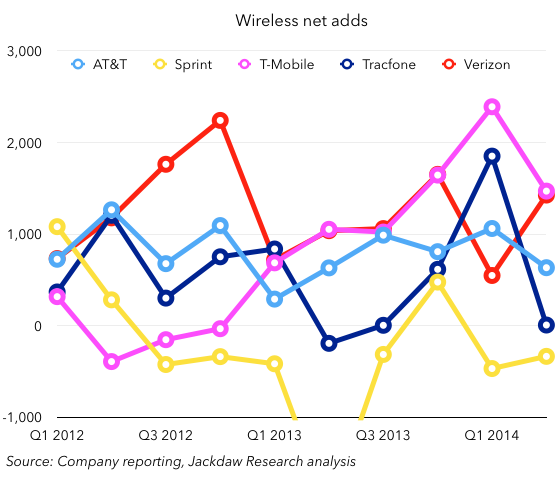 The chart above shows how all four major carriers, plus Tracfone, have performed in terms of net adds over the past couple of years. For those unsure, net adds measures the total number of new customers added, minus the number of customers that have left. And for the past five consecutive quarters, T-Mobile has been the best-performing carrier, or as close to Verizon as makes no difference. 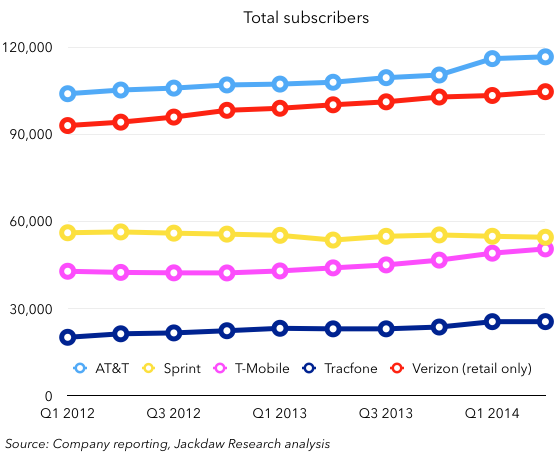 The very fact that a carrier with half the number of subscribers is performing as well (or better) than the #1 carrier is fantastic. Its net adds have been over 1 million in every quarter since the 2nd quarter of last year. 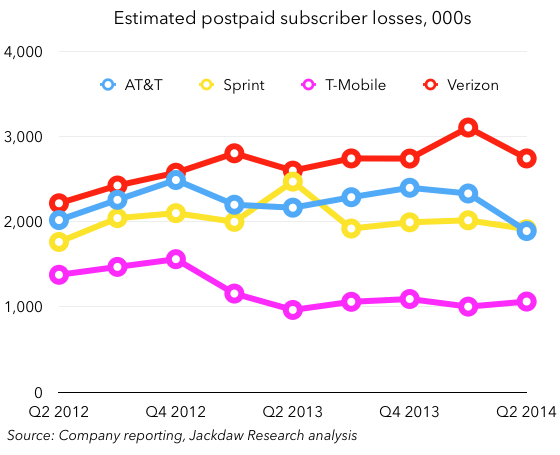 Part of T-Mobile’s success is that – out of all four major carriers – it’s losing the fewest subscribers. While 2-3 million customers have left Sprint, AT&T and Verizon each quarter for the past 2 years, T-Mobile’s only lost around 1 million per quarter for the past 5. Just look how close the magenta-colored line in the chart is to the yellow one now! T-Mobile is sitting on just over 50.5 million total subscribers, while Sprint is around 53 million. With the way things are going, T-Mobile could overtake Sprint as the #3 carrier by the end of this year. Perhaps the areas T-Mobile isn’t performing are ones that indicate just how competitive it is. Its profit isn’t as high as some of the other carriers, and average revenue per user (ARPU) is lower, as are few other financial metrics. But, if a company is going to be competitive, it has to take a hit somewhere. But we’ve already seen a few moves designed to address those issues. Changing the unlimited Simple Choice plan to $80 per month, adding the new pay-as-you-go minimum, and asking subscribers to pay at least 50% EIP if they want to JUMP! among others. We can just be glad T-Mobile returned to making profit again last quarter. Even if it isn’t making as much of it as AT&T and VZW. If you want to see more, read Jan’s full report. It’s a great read if you’re in to comparing stats. What I can’t figure out is what at&t is doing right? Verizon is definitely feeling the heat but it seems to be smooth sailing for at&t. Are all those millions of at&t customers sincerely not getting good reception with T-Mobile? I doubt it. It’s mostly coverage on rural areas. I can’t wait at the end the year. It’s gonna be a great 2014! Go T-Mobile go! Its being comfortable and being with a carrier for yrs. I have a friend that has 4 lines with his family they jumped on the new $160 plus phones plan. & even though there kids are kind of using up that 10gb of data tell them not touch there phones unless there on wifi. I am in NJ and have tried to talk them into switching. Even done speedtest at there house and showed them that T-mobile has changed but they think of tmobile the old way it was. I am a loyal spokesman for t-mobile to my friends since i left sprint a little over a year ago. Because I had sprint for over 10yrs. And it took them forever to get 4g in central NJ and now thats its here when i used my nexus 5 with them was only getting around 2-4mbps download speed where with my tmobile I average around 16-32mbps. As long as T-mobile keeps with there promise of getting rid of there edge by 2015 I be happy. Tell them to try out Test Drive. How can it hurt? I’ve told them, but they refused they rather be stuck to wifi at home thats DSL. That is slower then my phones 4G. Because they also rather stick with directv package. Because fios isn’t in there area. & they don’t like comcast. Not everyone cheats on their carrier lol. It’s just sheer coverage area that is TMo’s only weakness at this point. They rely heavily on roaming onto partner networks in many large stretches of the country, and they don’t have coverage, let alone LTE, along all the interstates yet. For people like my family, that means nothing and we are glad to pay less, but people who travel are going to stick with Red or Blue. They offer good corporate discounts, and have “good” customer service. I don’t think I ever had customer service problems with them other than the sheer amount of time they take to answer the call, got a few bill credits from them whenever they messed something up. They are quicker to respond to T-mobile than Verizon is. They offered the No Contract price for a lot of their members earlier this year that signed a contract before March. Coverage (and phones). If T-Mobile were anywhere close to the coverage AT&T has I would probably still be with them today. It doesn’t help that I would have to jump through hoops to get the phones I want to work with T-Mobile, either. Consider bundling… In other words, ATT offers more than just cell services so people may get their value that way. Some people view AT&T as a status symbol. I personally don’t get it but some people enjoy being able to pay more than a car payment for their monthly cell phone service as long as they can say they are with AT&T or Verizon. Coverage, reception and building penetration. It’s a combination of perception and reality. T-Mobile still has a long way to go in both areas. Many still have the perception that T-Mobile’s coverage (and possibly phones) are average at best, and possibly much worse. Areas that have been upgraded are great, but those of us in rural(ish) areas have a really hard time convincing people to switch. I am anxiously awaiting the transition in my area. The “major” city (50,000 people lol) has LTE, but drive 5-10 miles in any direction and you’re back on edge, or roaming on AT&T. Fix that & push the test drive and I think you’ll start seeing more and more switch over. They simply have better [voice and data] coverage. I left T-Mobile back in February to go back to AT&T. Yes, T-Mobile did just bring LTE to my city, but you couldn’t get AWS LTE or HSPA+ in most buildings, and there are a lot of holes, with the surrounding areas mainly being EDGE. AT&T (and Verizon for that matter) practically have LTE everywhere around here. For me, AT&T offers a consistent customer experience. The only time that I can remember not having service on my AT&T phone this year was when I was in the basement of my county’s courthouse in a storage room with no windows. Other than that, I always have 4G service on my AT&T phones; I don’t know what the ‘E’ symbol looks like on those phones. In the past service plans were more consistent with AT&T, but that is changing now. Still, I have been with T-Mobile for less than four years and have seen three sets of plans in that time. I’ve been with AT&T for over 10 years and am just getting to the third set of plans with them. There’s other little differences in the experiences that I have had with both carriers that would make me give the upper hand to AT&T, but those are anecdotal experiences. I too will re-iterate that answer. Coverage is king. And that means getting a signal out on the highway, and getting a signal in our daylight basement. AT&T gets those signals everywhere. Verizon does worse… I have a femtocell in my house to help with Verizon, and am about to jump back to AT&T due to the rural areas I visit. But T-Mobile doesn’t even come to the game… inside buildings or outside the city, my -past- experience was really bad. Which is a pity, because T-Mobile is the most compatible with phones I would buy on the open market. I’d love a Sony Xperia Z1 Compact – a full powered phone in a tiny body – but it doesn’t do AT&T’s 700 band, which, being 700, will penetrate buildings well. It will do those bands three times higher that TMob uses… which attenuate much faster. But coverage wins; I need it to work where I am. “But, if a company is going to be competitive, it has to take a hit somewhere”.. Right, profits are the right place to take a hit for a publicly traded company. Hopefully sarcasm? This is one of the biggest disconnects between what t-mobile is doing for customers versus what it is doing for shareholder/owners and financial sustainability. Where else would the hit be taken? Don’t be dense. Expansion isn’t free. Isn’t T-Mobile’s ARPU higher than AT&T’s? No I mean overall. That’s not in the slideshow. I forget where i saw it but T-Mobile was a bit above AT&T in overall ARPU. Fierce Wireless has different numbers that support your post. I suspect it is based on how you account for T-Mobile equipment adds. I found the fierce wireless article you commented on and are referring to the other day. Something has to give between the two sources on the data. Given T-Mobile’s aggressive pricing and being the pre-paid leader now, I’m strongly inclined to lean towards the analysis linked here over Fierce’s article. they still need to look at doubling the subscribers now.